The above info came from Who Wants to Know?, and was edited by yours truly (contact me). The image came from Zoids Evolution. The centuries pass, and as the civilization of planet Zi continues to evolve, so do the Zoids that co-exist with the human inhabitants of the planet. These days, organizations engage in various Zoid activities: not just battles, but courier work, guard duty, and for some organizations, illicit activities. A Zoid outfit called Mach Storm, doing its best to make ends meet, begins to become embroiled in an ongoing power struggle when a new type of Zoid emerges: the Fuzor, the fusion of two zoids to create a newer, more powerful Zoid. Bent on becoming the best, young RD of Mach Storm, now pilot of the famous Liger Zero, struggles to find a way to even the stakes when his archrival, Blake (now pilot of the Berserk Fury), finds his Fuzor partner. He finds it in the wild Fire Phoenix. The struggle of humans, Zoids, dark forces, and technology continues to advance, and the battles are only going to become more intense. Note: Zoids: Fuzors was canceled after 13 episodes in the U.S. due to low ratings. However, the series was completed in Japan, complete with updated animation. Zoids Fuzors is the third season of Zoids, a show which takes place on the planet Zi and are about animal-shaped machines known as Zoids. In this season, the Fuzors, which are two or more Zoids fuzed together, are introduced. The main character, named RD, pilots the Liger Zero for the Mach Storm Team. He is like Bit and Van from the previous seasons, stuborn, kinda stupid, and loves to pilot Zoids. His arch rival, Blake, who pilots the Bezerk Furry, is a lot like Raven from the first season, cold, calculating, and with a mysterious past. 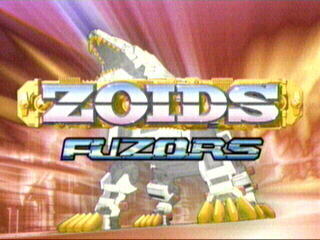 Zoids Fuzors is also about RD's search for the mysterious Alpha Zoid. Not much is known about it so far, but in pictures, it kinda looks like the Liger Zero.